Water, Mixed beans (cannellini, pinto and haricot) (25%)*, onion (19%)*, carrots (8%)*, Celery (6%), Chopped Tomatoes (5%)*, Tomato Puree (5%)*, Vegetable Bouillon, (Sea Salt, Yeast Extract, Rice Flour*, Palm Oil*, Celery*), Parsley*, Turmeric*, Sea Salt, Garlic*, Thyme*, Bay*, Black Pepper*. * = organically grown and processed ingredient. Production of organic palm oil does not endanger natural rainforest and habitats. 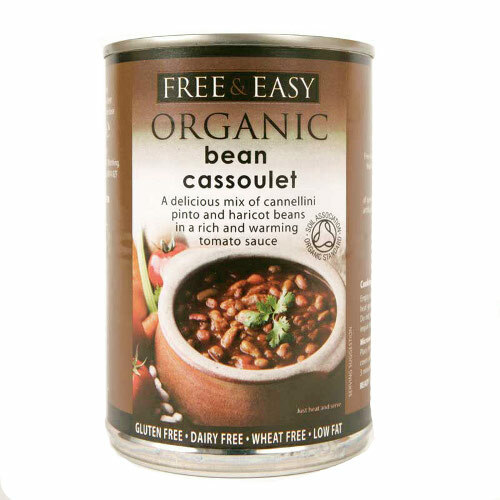 The Free & Easy Bean Cassoulet 400g product ethics are indicated below. To learn more about these product ethics and to see related products, follow the links below. Tasty and useful for the store cupboard. A good basic item for my store cupboard. There are currently no questions to display about Free & Easy Bean Cassoulet 400g.